Sheep Shaving and Speed Weaving. Its farm show time here in Pennsylvania. I don’t know how, but I could feel it in the air 100 miles from the epicenter at the Farm Show Complex in Harrisburg. 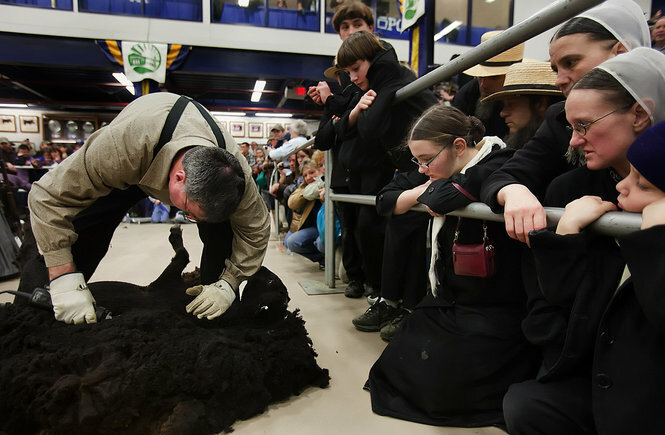 If you’re unfamiliar with the concept of a farm show, here’s a basic rundown: Its cold outside. Things are slow on the farm so its a good time to go shopping, show off your livestock, and get on some old school competition. So you put on your clean plaid shirt, suspenders and cap, and head to the Pennsylvania Farm Show Complex to look at tractors, thrashers, combines and other industrious equipment. You will consume funnel cake and possibly some shoe-fly pie. You will observe or partake in various competitions for animal husbandry, largest sow, best looking heifer… and then there’s the Sheep to Shawl Competition. A Sheep to Shawl competition is the textile equivalent of a lumberjack competition. The basic concept is right there in the name. You have a sheep. You need to turn it into a shawl. You are judged on speed, technique and final product. Its a strange combination of athleticism meets craftsmanship with a bit of figure skating theatrics mixed in. Its a team sport where each individual has a task. You have a shearer to shave the sheep, a carder to prepare the wool, a spinner to turn the wool to yarn, and a weaver to turn the yarn into a shawl. I’m not sure if its required, but i think you have to wear colonial costumes. The setting is the same colosseum section of the Farm Show Complex where they trot around the animals for show and for auction, but they clean up the ground first. then the teams setup the equipment: shears, carders, spinning wheels and looms. The sheep are brought in and the pressure is on. The competition takes on a John Henry aspect where craftsman create shawls with a furious pace that rivals machinery. In the end, the finished product and performance are judged and then the shawls are put up for auction. Many years ago this was my introduction to hand weaving when my mother was a spinner on a competitive sheep to shawl team. I was probably not remotely as enthralled with textiles then as I am now, but it was a seed, perhaps. Its strange to think that I started my textile career as a hand weaving traditionalist Luddite. This entry was posted in craft, Textiles, woven. Bookmark the permalink.